10 unique bridal shower ideas that bring the fun factor! If you're a bride to be, chances are you've got an army of amazing bridesmaids, friends and family members behind you to help support you throughout the journey. Part of their job is to throw you a bonafide amazing bridal shower, but if they've never thrown a shower before, it can be hard to figure out step one. Especially with an event that's a little bit traditional (and dare we say outdated sometimes?) the stakes are high to make it awesome. So how do you throw a bridal shower of your dreams? Well, this blog post is a great place to start! We've rounded up ten of our favorite fun and unique bridal shower ideas to make the day memorable for everyone. Read on for more tips! Does the brides love cookies? Donuts? Cake? When it comes to bridal shower food ideas, making the dessert table fun and full of the bride's favorite treats is an easy way to make the shower memorable. Make them extra bridal with fun shapes and ultra-feminine colors. What was your favorite party activity when you were a kid? Pinatas, of course! There's no reason why you can't have a pinata at your bridal shower, filled with fun treats like lipstick and candy of course. We love this DIY-able lipstick pinata by Studio DIY! 3. Chalkboard count down sign — it's a must! This seems like a small detail, but this fun little sign makes for the best photo ops. The most meaningful gift from a bridal shower won't be the cake plates or serving ware — it'll be a meaningful keepsake from the people who love the bride most! That's why we love this idea for a framed print of everyone's lipstick & signature — what a great way to keep memories for years to come! Prizes can be a hit or miss part of bridal showers — either your guests are going to leave with lots of lovely items, or things that may put in their desk drawer and never look at again. We love the idea of making surprise prizes with this DIY party poppers tutorial. Fill with lipstick, mascara, and other fun beauty items! Is any bridal shower complete a DIY mimosa bar? Nope. Just add one for instant bridal shower success! Don't lose your newly made mimosas! These engagement ring-shaped drink labels are the perfect way to keep everyone's drinks in the right hand. 8. A bartender for fancy drinks! Maybe you want to take it a step up from the DIY mimosa bar? If that's the case, then hiring a bartender to make a few signature drinks is a great option for taking the bridal shower up a couple notches. Why keep the photo booth fun until the wedding day? A photo booth with a fun backdrop is an amazing way to add some extra fun to the wedding day and capture all those special memories. Bridal showers aren't complete without games! 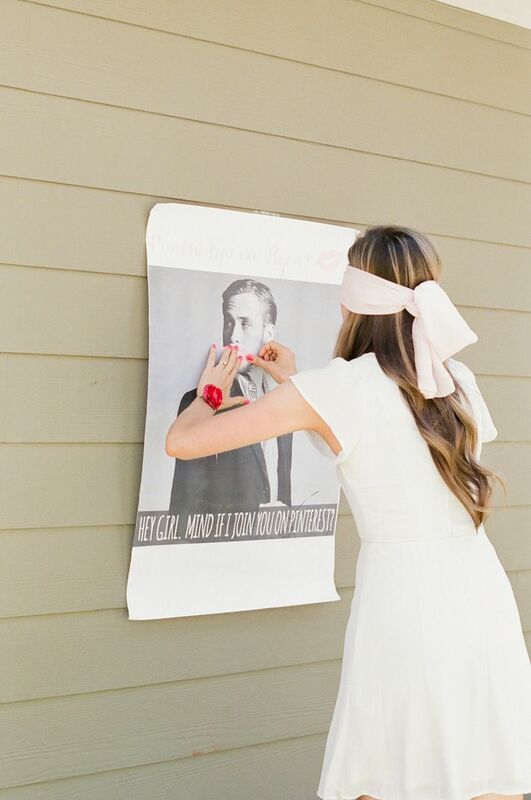 While there's a wide variety of unique bridal showers games out there, we love the classics that stick to the bride and groom's relationship... and maybe some pin the lips on Ryan Gosling, of course! Need extra help planning a bridal shower? Use this bridal shower checklist by POPSUGAR for inspiration and a timeline to get everything planned out and in order... a great shower never happened with a lack of planning! Are you planning a bridal shower for your friend or family member? Let us know what you're planning on doing to make it special in the comments!